Tech by Dennis Kioko: iPage Web Hosting, Where's The Catch? iPage Web Hosting, Where's The Catch? 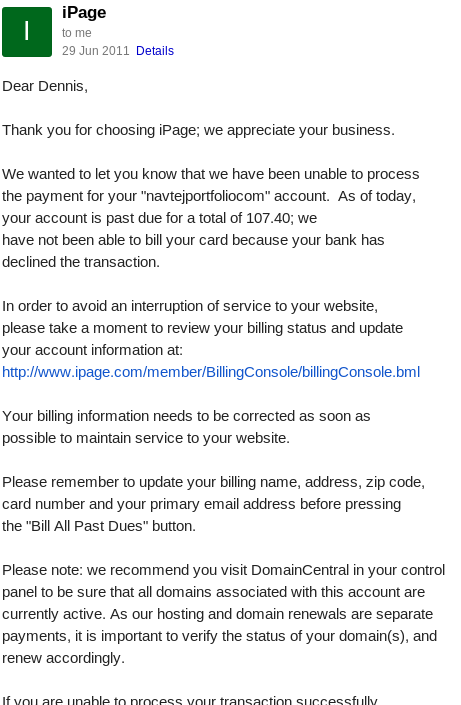 There's this web host called iPage. They have very attractive rates, usually about a dollar. The features they offer are quite good, and very enticing. The are very aggressive, their adverts will follow you everywhere on the Internet once you visit their page, and their emails will flood your inbox once they have their email address. So what's the catch with their dirt cheap hosting? 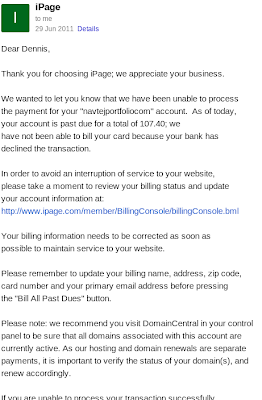 Renewal, you hosting for the first new year as a new client at iPage might be less than $15. Your renewal invoice, however, will be upwards of $100. They hook clients by offering dirt cheap hosting for the first year, then hike up your prices in the subsequent years. Such clever individuals. If they notice you are cancelling renewal due to price hikes, the chaps then offer you a slight hike, say at about $2 a month to keep you. One thing I did when signing up with them was to use a PayPal account, rather than offer them my debit card. I wonder what would have happened, had I given them my debit card. Lately, I see they have changed, indicating on their page that their $1.89 hosting is 77 percent off their normal $8.49 monthly price. So you sign up knowing that you are on a discount package. Their model, though, seems to work fine. And their support was also okay when I used them, but moved to djangohosting.ch for modular Pay-Per-Use hosting and asmallorange.com for small hosting.